our little visitor from the previous night turned up again but this time we were prepared - all the dog food was in the tent and we had the tent annexe door just velcroed up but he still managed to poke his head through to have a sniff so we ended up putting the chairs in front of the door ... we didn't hear from him again! Again the night was cold and this morning when we woke it was 4 degrees ... couldn't wait for the sun to pop up so it would warm up the air ... well it popped up alright along with a light southerly breeze so it dropped the temperature even more! What made it worse is we were having water bladder problems and our hands were getting wet and when the wind blew the finger tips just froze and wouldn't work when it came to opening and closing things! The day before Neil had the bright idea to remove and throw away the caps for the 2 smaller bladders as he doesn't like them and they get in the way ... true they do get in the way but I manage okay with them and don't mind them ... so he threw them in the bin and when it came for me the next morning to pack the full bladders away I noticed alot of water around the tap part and also one was nearly empty. I investigated and found one had a tendancy to push water through the tap when you squeeze the bladder hence why it is best to have the cap on!... the other was okay without the cap. So I said to Neil he will have to find the caps in the rubblish bins! It didn't take him long to find them ... lucky as the one that would leak without the cap is useless! So with all that and the freezing up of fingers and generally both of us freezing despite the sun shining we got away really late by our standards - 8.45am! Fortunately just down the road at the 13km mark is the state border and our clocks go back 30 mins so the departure time looks a little more respectable at 8.15am! 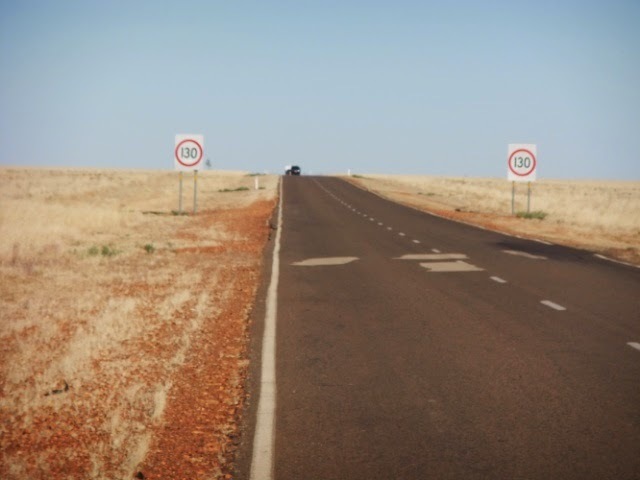 So we are in the Northern Territory - last time is was here 20 odd years ago there was no speed limit in force but now they have a 130km speed limit - although I have heard there is an open speed limit (like there use to be) somewhere around Tennant Creek - we will find out soon enough! 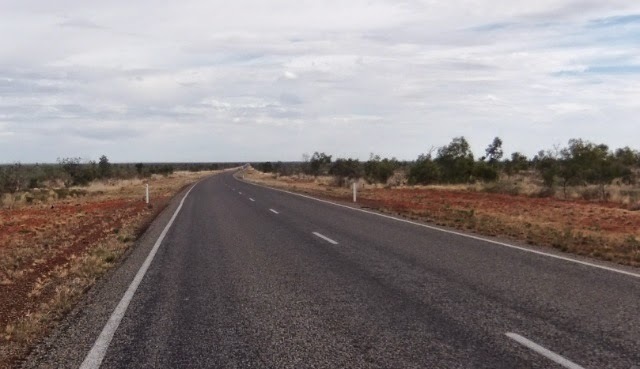 As you can see from this photo the area is pretty sparse and is completely devoid of trees or shrubs - it was like that for the bulk of todays ride to Avon Downs - the only time there were trees was when you crossed a dried up creek. 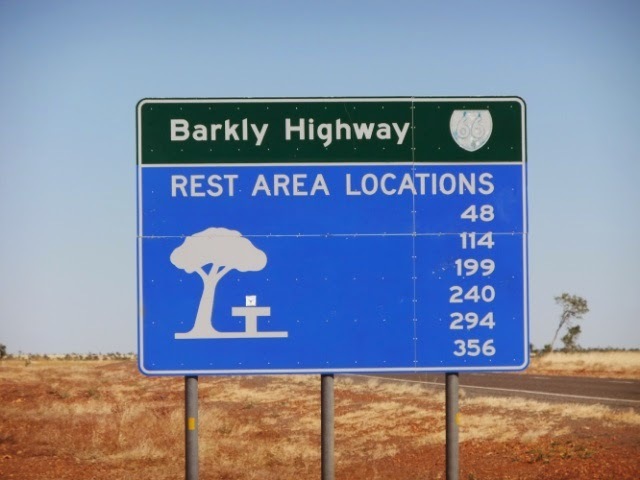 At 21km they give you a sign to show you the distances to rest area along this Barkly Highway. So our destination today is the first one - Avon Downs rest area. The traffic is pretty light - mainly trucks and caravans and also cars towing pop tent trailers as we are presuming they are all heading home since it is the end of the school holidays. Everyone is tooting and waving at us even the road train drivers are honking away. 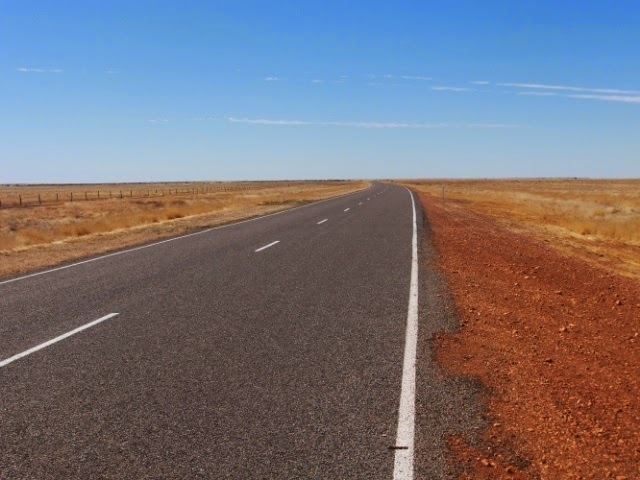 The traffic seems to come in waves - those leaving Mt Isa, those leaving Barkly Homestead, those leaving certain rest areas, so sometimes it is just us on the road. The road itself is okay, most of the time the surface is very uneven and so you are bumping along and the bumps are unavoidable, otherwise the road isn't breaking up like alot of the major highways are. Sometimes we have a shoulder albeit narrow but most of the time we don't need it as there is plenty of room for everyone to overtake us. Now you may remember a long time ago I mentioned going to the toilet in the open road behind a bush and sometimes you have to cross the road with your toilet paper and spade in hand and everyone passing by knows what you are going to do ... well here out here there is NO bush to hide behind! 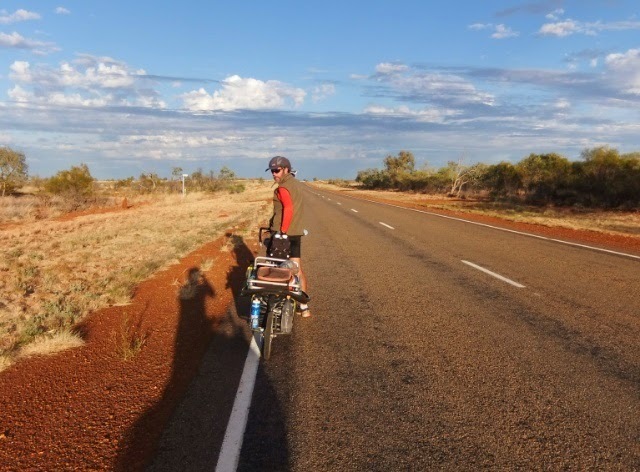 so I have to crouch beside the bike, quickly dig a hole, pee and quickly pull up the shorts etc ... meanwhile Neil is keeping a look out as you can see the traffic coming from miles away! We get to Avon Downs rest area mid afternoon (time adjusted!) and there are already a few campers there. It is opposite the police station and has a eco toilet (a long drop that doesn't smell in the actual toilet but does smell outside the toilet ... go figure!) and 2 water tanks that say that the water MAY not be suitable for drinking. 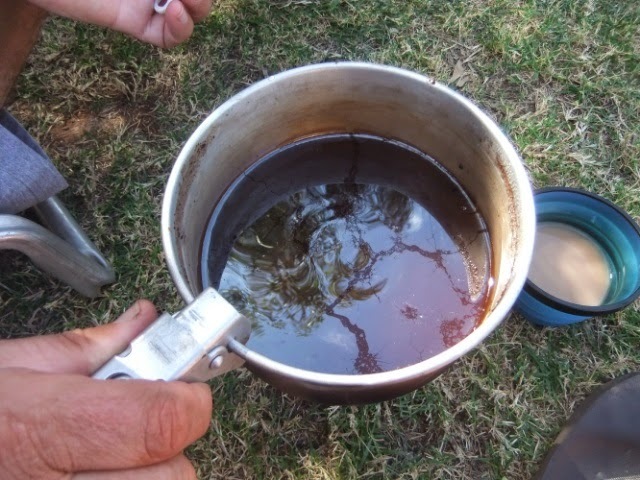 so we use it for washing and boiling our cuppas. We need to set the alarm ... we woke later again and this time at 6.30am (we really want to be up at 6am) Last night it was a full moon and it was so bright that when Neil woke in the morning he couldn't tell the difference between night with the full moon and day break - hence why he got up so late ... me I was just asleep for too long! So we will set the alarm on the phone to 6am for tomorrow. It was a warmer morning than the past 2 and the wind was already up and had shifted from a southerly cold wind yesterday to a more pleasant south easterly which would mean that for the first part of the ride we would have a tailwind and for when the road swings towards the south after 30km we would have a cross wind. On the road at 8.30am this morning, late as per usual and Neil saying that it is just too cold to get up too early, he is making all sorts of excuses! It is a quiet road this morning and we continue on for around 15km of open no tree scenery. Then all of a sudden out of nowhere we come across tree shrubs on both sides of the road and this continues for about 20km and stops just before Soudan station and from there we have about 13km of open no tree country and then back to tree shrubs for the rest of the day to our bushcamp at 84km. In fact you can sometimes see little dots moving on the horizon and you know that is oncoming traffic or traffic that has over taken you a while back! We had a late lunch and cuppa at Soudan Bore rest area and obviously the travelling public liked to celebrate Christmas early and decorate the surrounding rest area with their damn toilet paper! it drives me nuts to see this in rest areas and alongside the road just toilet paper blowing everywhere ... why the heck can't these vans, caravans, cars, trucks carry just a simple light little shovel for digging a little hole to bury the toilet paper ... I mean they are carrying everything with them already - how hard is it to include a little shovel! I mean we have one and we are on damn bikes! 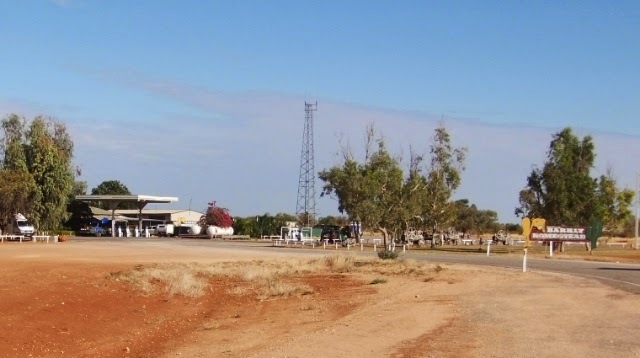 Needless to say this rest area doesn't have a toilet and the water is actual bore water and is a little brackish to drink but is fine for washing so we filled up the 2 smaller bladders and continued on to our bushcamp a further 17km up the road. When we did get to the Soudan Bore rest area poor little Kouta had a small accident in his basket so fortunately Neil could clean it up and wash his mat ... why he hangs on and doesn't go to poo when we take a break I don't know!!! So our bush camp is a pretty good one, we are opposite the Telstra tower in amongs the tree shrubs and about 40m but no one can see us as the shrubs are close together. Dinner tonight was those Continental pasta packets (have to use 2 single serves - each single serve apparently serves 4!) with carrot, dehydrated peas and 125g of salami ... Neil loves this type of meal now! 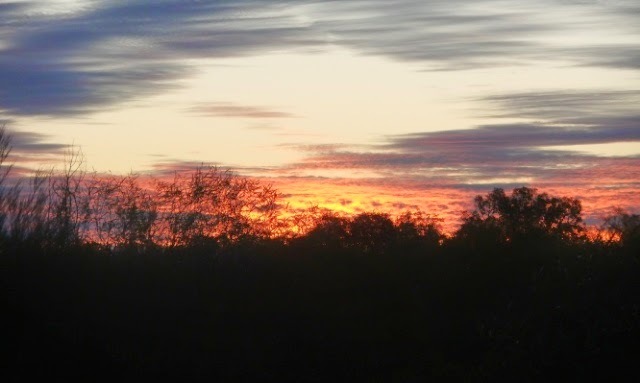 Our sunset was pretty tonight as there is a bit of cloud about.. 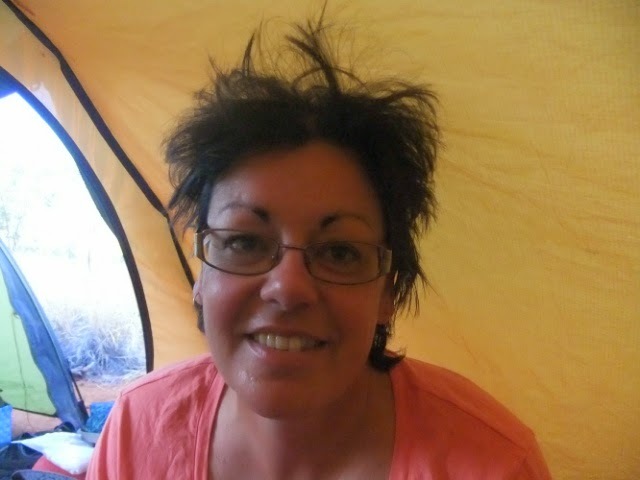 The alarm worked pretty well this morning although it felt like I hadn't slept at all - the wind blew hard all night and the tent was flapping about and kept waking me up. While we were having Brekky Neil was looking somewhat concerned about the direction of the wind ... ever since Camooweal he has mentioned the wind every day! This morning there was a slight shift back to the south which is okay but it is alot stronger than what was forecasted. For the first time is weeks we have got clouds in the sky, I think they forecasted mainly sunny for this area but no rain ... Neil thought there might be a rain cloud or 2 amongst them but as it turned out there was no rain today. Lucky we had the alarm set as we were off at 7.30am. 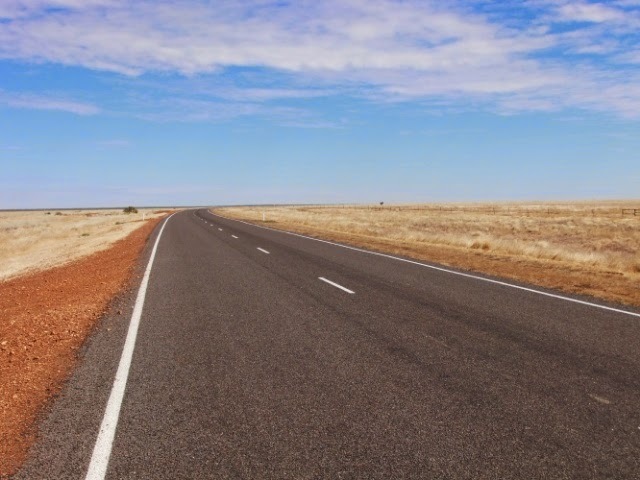 There is no one around as we are about 150km from Camooweal and 110km from Barkly Homestead so we won't be getting traffic for a while. The wind is coming across our shoulders at first and then swings behind us all together thanks to a bend in the road that veers it more north and also the forecasted swing to a east south easterly. It did die down a bit compared to the wind first thing this morning. With the wind behind us we are sitting on quite a good speed of anywhere between 19 - 22km per hour. first ones to offer us anything - it must be a 5000km thing! At lunch time we stopped at Winorah bore rest area at 68km and this is a very basic rest area complete with its' toilet paper decorations. Only 1 table (taken up by a caravaner) and a water tank. The water is okay to drink a little bit borish but drinkable. We used it for our cuppa and there wasn't much scrum or oil on the top and I had a drink and it tasted okay just marginally salty. We filled up the 2 small bladders to use for washing tonight and continued on. 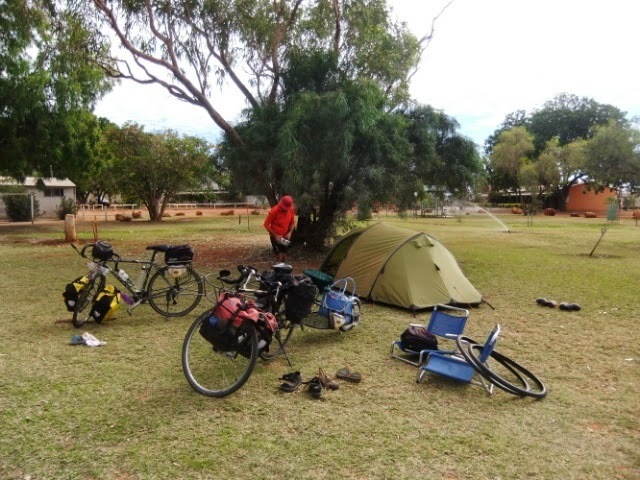 We estimated we would go another 18km and bush camp and that would leave us 25km to Barkly Homestead tomorrow (so we have a mini rest day). Unfortunately the area is not as good as the previous night to bushcamp. 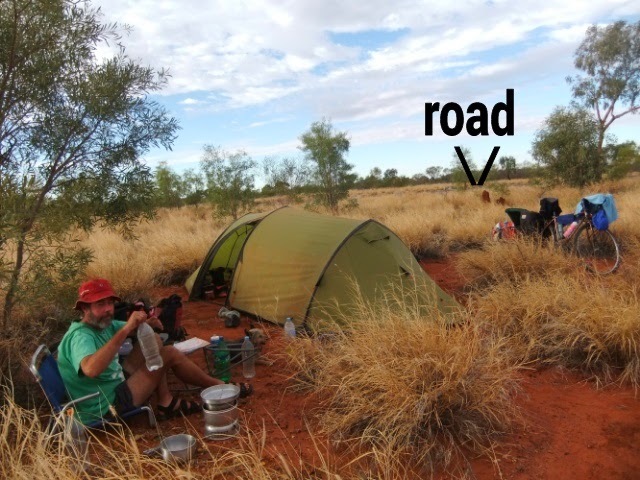 The shrubs are further apart and around them is native grass which is difficult to put your tent on. We tried about 4 spots but we were unsuccessful in finding a spot that was cleared and big enough for the tent. We even tried a gravel pit but couldn't get the tent pegs in! We finally found a spot that is very tight to fit the tent in and it is also close to the road. We are about 30m from the road, but there is not much traffic especially at night and I don't think anyone noticed us there even though we are out in the open! This camp spot, along with last nights one, comes free with flies ... crikey they really tried for your eyes, nose and mouth whenever you went into the sun, so we tried to stay in the shade and even then they still came to annoy you. They finally left at sunset as it was too cold for them! 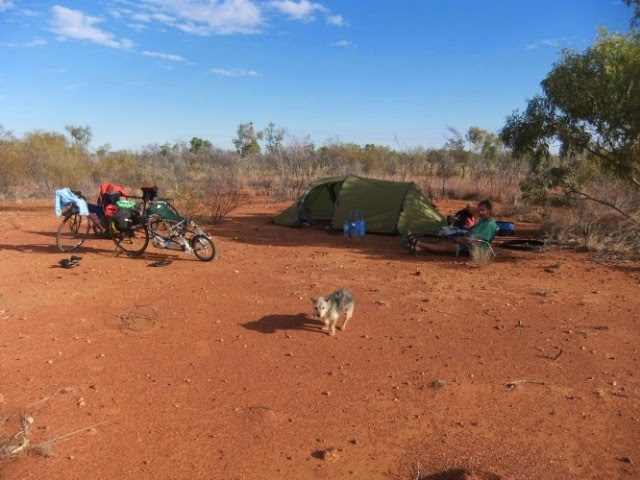 we arrived here at 9.30am and most caravaners had already gone so since we are in the Northern Territory now most of our camp fees (unpowered) are per person so it is $30 for the 2 of us but if we took a powered site it is $35 - unpowered sites are so over priced! Either way we are 187km and 264km from the next petrol spot! Straight after setting up the tent I went for a badly needed shower. So I got in, was in there for about 5 mins and finished shaving (more like mowing!) my right leg and what do you know the water stops! so I try the hot and cold taps again, off on off on ... nothing! So I dry, dress and go to the next shower and there is no water. So I go outside and go to the other toilet block ... please remember I am walking around this caravan park with one shaved leg and the other unshaved (I hope no one can see it!) but they are renovating it so I walk back to Neil cursing as I am thinking I have to spend the next few hours with one shaved leg and one unshaved leg and not too mention a seriously bad case of helmet hair! I spot the cleaner and say there is no water in this shower block and she said it is because everyone before has used all the water but I can have a shower at another block that is all ensuite style so I go over there hoping like hell I can at least have enough water to shave the other leg and also wash my hair ... I managed to get both done! This Homestead does a roaring trade and doesn't stock food like in a shop (so we can't get bread!) 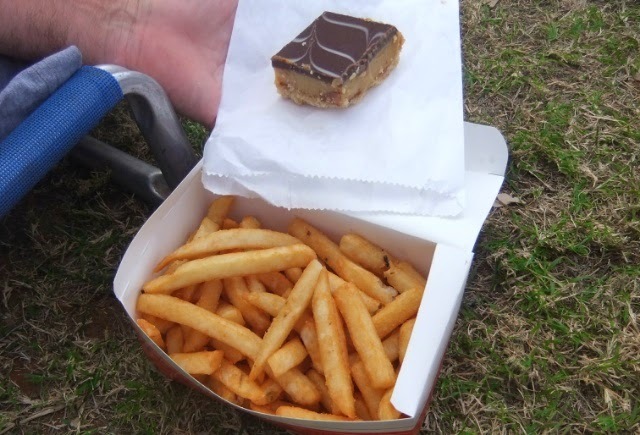 it has more cafe and takeaway style food so for lunch we had a large serving of hot chips ($6) and a caramel slice each ($4.50 each). We thought the food prices were reasonable considering where we are! 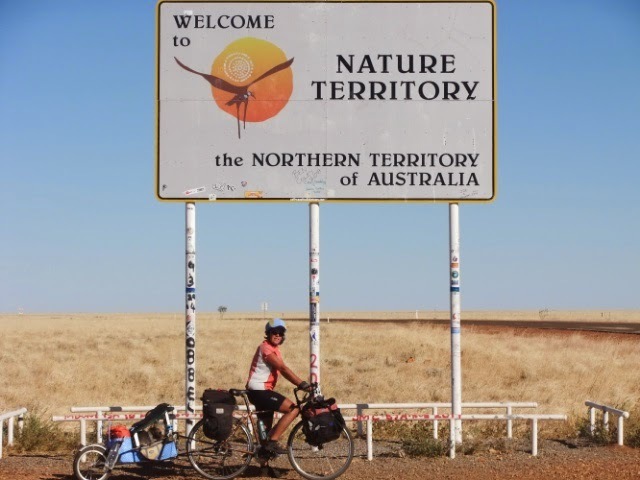 the water is not bad tasting to drink straight as well so we will restock all the bottles for the next leg to Tennant Creek - we will be there on Friday. It is nice getting here so early and having a sort of rest day, plenty of caravans turning up now. Even though we were only on the road for 1 hour today there seems to be alot of horse floats going towards Mt Isa - we think there may have been some sort of rodeo or camp draft on at Tennant Creek over the weekend. We get internet reception here and will watch the Geelong vs. Melbourne game that we missed on Saturday - we don't know the results as we haven't been able to pick up any radio over the past 3 days. 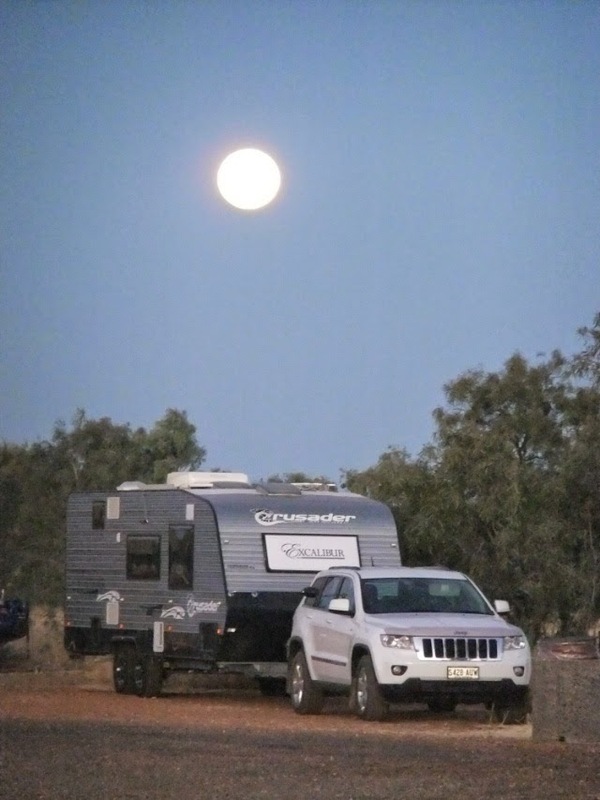 Next posting is Friday @ Tennant Creek.